There are many construction lending risks that initially fly under the radar during the life of a construction to permanent loan. It’s only when the risk hits the fan do lenders see the problems and what could have been done. 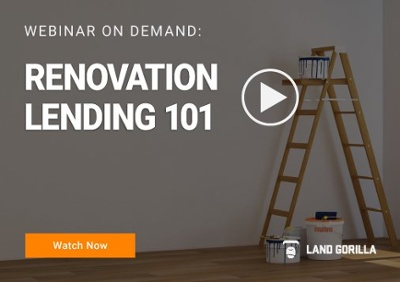 Join Land Gorilla to learn how to get started with 203(k) and HomeStyle Renovation loans, typical renovation loan processes and costs, required disclosures, and key performance indicators essential to their success. Going digital can shorten your draw process times by 9 days, reducing risk and project delays. Learn about the three perceived obstacles to construction lending and how banks can remove these barriers to a successful future of construction and renovation lending. Join Land Gorilla and zlien as they present a guide to make mechanic lien waivers a frictionless process in construction lending. Join Sean Faries, Land Gorilla CEO, to learn the opportunities community banks have to fulfill the construction needs of their community, all while remaining TRID compliant. Join Asurity Mortgage Group and Land Gorilla to learn how to create compliant construction loan packages to improve efficiency, mitigate risk, and reduce costs.